There is absolutely no doubt that there is a strong connection between mental health disorders and substance abuse. According to the National Institute on Drug Abuse, about half of those who suffer from a mental illness also experience substance abuse, and vice versa. In fact, some would argue that substance abuse is a mental health disorder and others claim that substance abuse is an attempt by those who unknowingly suffer from a mental health disease to self-medicate. Drug users, despite the frequency of the use or the drug of choice, are seeking a disruption from their normal thought process. This quest can include “taking the edge off” of a stressful day, finding the euphoria or sedation offered by other drugs, or intentionally altering the mental or conscious state. While the desire to find a temporary escape is not a problem if done in moderation and infrequently, this comfortable, peaceful, or detached feelings of inebriation can mask mental health disorders and even cause them. 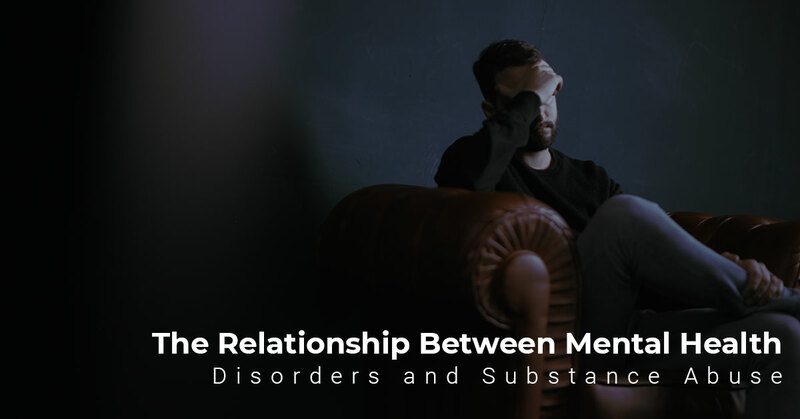 Join us in today’s post as we dive into the correlation between substance abuse and mental health disorders. Do Mental Health Issues Cause Drug Addiction Or Does Drug Addiction Cause Mental Health Problems? This question may be more comparable to that of which came first- the chicken or the egg? The link between substance abuse and mental health disorders is so strong, it can be difficult to identify which one caused the other. We do know that some people are more susceptible to mental health disorders and then there are also those that are more predisposed to addictive behaviors, but little research exists that identifies them as one and the same. With the stigma surrounding both mental health disorders and substance abuse, and the common belief that both may be caused by personal choice and behavior, those who suffer from these experiences are often hesitant to talk about it, especially before it manifests as a problem. As mentioned previously, it is not uncommon for those who suffer from a substance abuse problem or drug addiction to also meet the criteria for a mental health disorder. 84 percent of the world’s cocaine and 69 percent of American alcohol is consumed by people who have been diagnosed with a mental health disorder at some point in their lives. Typically, when a drug addiction is developed in those with a pre-existing mental health disorder, it is because the mental health issues have gone unaddressed and the person either seeks or accidentally discovers the powerful self-medication that mind-altering drugs offer. Depression: Marijuana for the numbing effect. Adderall, cocaine, or meth to improve mood and energy. Anxiety: alcohol to relax inhibition and quell fear. Benzodiazepines or valium to quiet or calm thoughts. However, what about the other half of people who suffer from a drug addiction and do not have a mental health disorder? Identifying symptoms of mental health disorders and seeking proper treatment can help prevent those who suffer from seeking out drugs as a method of self-medication. Effective mental health counseling can help those with a mental health disorder discover symptoms and side effects and offer coping techniques and ways to identify triggers. Additionally, safe medications can be prescribed to help treat symptoms without altering consciousness, personality, or the ability to function. It is not fair to simply state that 100 percent of drug addicts suffer from a mental health disorder based on the fact that drug addiction itself meets the criteria of a mental health disorder when it changes the hierarchy of needs or a change in brain circuits that exists after detoxification from the drug. When this happens, a person prioritizes drug use over everything else, even basic life needs, which creates compulsive behaviors and is no longer able to control or moderate use. Alcohol and drugs that are abused alter the body in some way. Whether it is a temporary intoxication or a permanent alteration of the brain, as with heroin, there is the propensity for the substance to either make long-lasting alterations to the structure, functioning, or chemical makeup of the brain or body, or to establish behaviors and patterns that change the personality of the user. Some substances, such as meth and heroin, alter the physical and chemical makeup of the brain that can lead to severe deficits and permanent changes in mood and behavior. Cocaine and heroin provide such a euphoric high that it is nearly impossible to find the joy in life without it, making a normal day seem like a low low and the bad days feel like a bottomless pit. Other drugs, like alcohol, become such a part of a user’s routine that it can change the behaviors and patterns and make it difficult to recognize the self without the substance. Additionally, drug use puts people at higher risk for being targeted in violent crimes and sexual violence, which can lead to serious mental health issues including depression, anxiety, and post-traumatic stress disorder (PTSD). For those who began using illicit drugs without an underlying mental health disorder, the exposure to situations and circumstances that they would not otherwise experience can be enough to trigger or create a mental disorder. When looking for a substance abuse treatment program, it is important to find one that understands that drug addiction is not simply the act of using a substance. Successful treatment programs should focus on more than the physical detoxification from a substance. Drug addiction recovery requires learning how to avoid relapse, which requires identification of the reasons for use and personal triggers. Many times, addressing the underlying causes of mental instability — either situational or due to a disorder. Mental health counseling as a part of a drug rehabilitation program can help a patient identify the underlying cause of their substance use and teach effective coping techniques to prevent relapse. At Metro Rehab, we understand the importance of mental health counseling as a tool for breaking the addiction. We use a variety of counseling methods including individual and group counseling, as well as on-going support groups and crisis intervention. For more information about our programs or to get started on your road to addiction recovery, contact us for your free consultation today.